This is one of the dinners we made in the Creative Healthy Cooking Class last Fall… Still one of my favorites. So simple and so delicious!!! Cook two whole delicata squash in oven at 325° for 30-45 minutes. The squash is done when slightly soft to the touch. I prefer to keep them intact with seeds inside while cooking to maximize the moisture content. When done cut in half lengthwise and scoop out seeds. Then fill with confetti quinoa and pour over some hemp lime cream sauce. Can top with chopped tomatoes and cilantro as a beautiful garnish. Place garlic and onion in food processor and mince, then grate or mince up remaining herbs and vegetables until small pieces. The mix of veggies should be colorful like confetti… you can add whatever veggies you like, these are just some of my suggestions. Add chopped tomatoes and mix into cooked quinoa. Make the quinoa as you are prepping the veggies so it is still hot to mix in the veggies, lime juice, and salt. 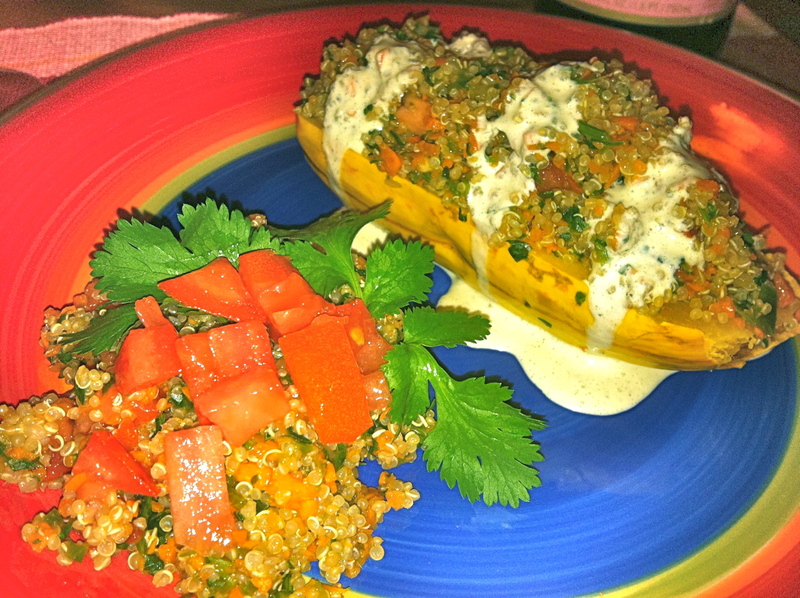 Then stuff squash with confetti quinoa. My preference for squash is delicata since it is so sweet and makes nice sized portions… each person gets one half of the squash. Blend hempseeds*, salt, lime juice, and nutritional yeast, with enough water to make a creamy sauce. If you have added too much water, just increase the amount of nutritional yeast to thicken. Or conversely if the sauce is too thick just add a little more water until desired consistency. *In place of hempseeds you can use raw sunflower seeds, cashews, or almonds… Any raw nuts you like, but it is helpful to soak them first. So Inspired by this recipe! I was just roasting vegetables for a gluten free, veggie quiche and now I think I will stuff the acorn squash and whip up some quinoa for tonight’s supper while I am at it!